A-PRP is a biological product prepared from your own blood, this is combined with RegenKit-BCT medical device. This makes this treatment inherently safe and free of transmissible disease. PRP is rich in growth factors and bioactive proteins essential to initiate and speed up tissue repair and regeneration. Your platelets deliver an increased number of growth factors in their biologically determined ratios. Collagen fibres which lead to enhanced and rejuvenated skin texture and elasticity. Growth factors to increase tissue repair and regeneration. Stimulates hair growth and increases hair volume & strength. Platelets are key factors in hard and soft tissue repair mechanisms. They provide essential growth factors, which involve stem cell proliferation. They also stimulate fibroblasts and endothelial cells to induce new tissue growth. These platelets are concentrated from your own blood stimulating and rejuvenating your skin to grow and repair. Your PRP stimulates your cells to regenerate your skin and connective tissue, resulting in accelerated healing, it improves elasticity, tone and skin thickness and contributes to rejuvenated collagen fibres. Jill will collect a sample of your own blood and separate its components through a centrifuge process. This process isolates your platelets and plasma. Your concentrated platelets contained in A-PRP once injected via U225 device, will release growth factors stimulating fibroblasts and collagen and elastin fibres. 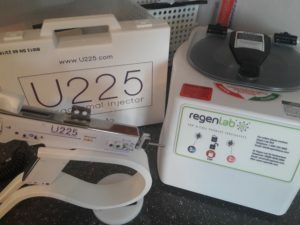 Jill’s U225 plasma rich platelet delivery device is top of the range in pain free delivery, the treatment can take up to one hour in total, and post treatment is simple and effective. You can expect an increase in skin elasticity, your fine lines will be significantly smoother, and any uneven pigmentation will be less visible. PRP treatments also reduce appearance of deeper lines such as naso-labial folds and marionette lines. You will notice improvement in the first few weeks following treatment. For optimum results; a course of three treatments, four weeks apart, followed by treatment every 6-9 months to maintain rejuvenating effect. Your lifestyle choices will affect the outcome of treatment, smoking, excess alcohol and sun and sunbed exposure will reduce overall effect. There are very few side effects associated with A-PRP it has been used widely in medicine for medical treatments such as improvement in wound healing and bone regeneration.